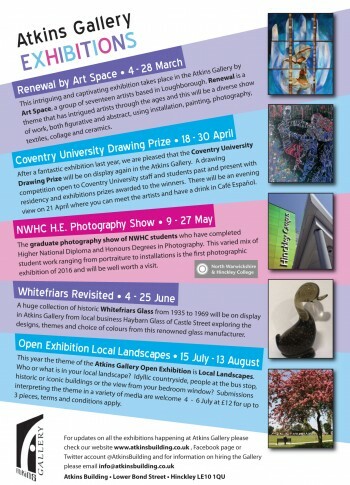 The Atkins Gallery has a busy schedule this spring and summer meaning there is always something to look forward to. The all-important dates for your diaries are included in our snazzy promotional poster. Back for their second year running, Coventry University Drawing Prize promises to be an eclectic and memorable exhibition this April. Similarly, students from North Warwickshire and Hinckley College return this May following last year's exhibition for another fantastic collection of work entitled H.E Photography. WhiteFriars Revisited showcases some wonderful examples of Haybarn glass in June with the opportunity to get your antiques valued and sold at auction by Lockdales on Thursday 9th June, 11.30am-3.30pm. Not to be missed during the summer is our second Open Exhibition so artists get on the lookout for some inspiration and submit your artwork for this 'Local Landscapes' themed collection. If you are interested in participating, please download an Exhibitor Pack, which includes terms and conditions and payment instructions. Remember there will be an Evening View on Friday 15th July to launch what should be an exciting and variegated Open Exhibition. Refreshments can be purchased from Café Espanol and entry is free, giving you the opportunity to look at the artwork and meet the artists involved. Included in the prizes were a Michelle Kemp Photography gift voucher for pre-wedding couple photo shoot including one mount print; £50 gift voucher from Sue Todd of Designer Travel; a hamper of best-selling Forever Living Products courtesy of local representative Jennifer Plester, Choices Floristry gift Voucher; £100 towards wedding décor when selected from the WOW Business; free chair covers from The Meeting Centre and a custom made vanilla sponge cake made specially by Ann Patchett of Ann’s Party Catering. The prizes were presented to Hannah and Ethan in Café Español on Saturday 12th March 2016 and several exhibitors re-joined them for a cup of coffee to celebrate as photographs were taken. The Atkins based staff would like to congratulate Hannah Mason and Ethan Hawkins and wish them all the very best for a happy future together.